Executive Director Alvaro Bedoya, Deputy Director Laura Moy (center) and other staff of Georgetown Law’s Center on Privacy & Technology at the 2018 “Color of Surveillance” conference on July 19 examining the government monitoring of American religious minorities. On June 26, the Supreme Court upheld Presidential Proclamation 9645, restricting the entry into the United States of persons from eight foreign states. Often referred to as a “travel ban” or a “Muslim ban” (affecting predominantly Muslim countries), the measure was at least in part about surveillance, said Alvaro Bedoya, executive director of Georgetown Law’s Center on Privacy & Technology – as he introduced the 2018 Color of Surveillance conference examining government monitoring of religious minorities in America. Bedoya and other scholars began the day with a historical look at the surveillance of religious minorities – from the surveillance of 16th and 17th-century Catholics and Pilgrims to Mormonism and later, the federal government targeting in the 20th century of Muslims, Jews and the Southern Christian Leadership Conference. “The Constitution, as you can easily tell by reading it, was written deliberately to exclude religion,” said Bennington College Professor Brooke Allen, in a discussion of whether the Founders believed that the United States was a “Christian” nation. Interestingly, there are only two mentions of religion in the U.S. Constitution, Allen noted – both giving religion a negative role in the government of the country. The conference demonstrated that along with law and policy, art and culture can have an impact. Filmmaker Assia Boundaoui and her mother Rabia Boundaoui shared their experiences in a Muslim community in the Chicago suburbs in the 1990s, when FBI agents would come to their door, watch them from the street and even go through their trash. The detrimental effect of surveillance on a community is documented in Assia’s film “The Feeling of Being Watched,” which premieres in October. Artist Adam Harvey, who designs clothing that addresses the rise of surveillance, also spoke at the event. Poet Fatimah Asghar, who is Pakistani-Kashmiri-American, spoke with Renata Barreto of the Center on Privacy and Technology on her experiences in America after September 11, 2001. Ashghar’s poems have been published in a collection called If They Come For Us (Penguin Random House, 2018). Bedoya led a conversation on countering violent extremism (CVE) that included those who support CVE programs in a community, in the interests of national security. These programs might include the provision of social services or creating de-radicalization “off-ramps” for individuals who are attracted to extremist groups. But activists, particularly many in the audience, protested that they have experienced CVE programs as an unwanted intrusion. Laura Moy, the deputy director of the Center on Privacy, talked to two persons who witnessed the surveillance of mosques by the New York Police Department, and fought back in the courts. Asad Dandia became a target of surveillance when he volunteered at a charity to assist underprivileged families. Farhaj Hassan, a member of the U.S. Army Reserves with a security clearance, stopped going to mosques in New Jersey for the sake of his military career when he learned it was being targeted by the NYPD. He later joined a lawsuit and won. Bedoya noted at the outset that the purpose of the day was not to malign the U.S. intelligence community but to talk about the disparate impact of surveillance. 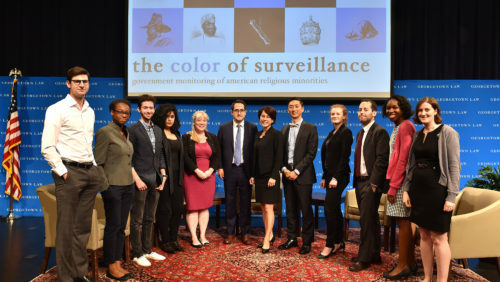 Georgetown Law Dean William M. Treanor said that the Color of Surveillance series, now in its third year, explores the intersection of religion, race and surveillance.